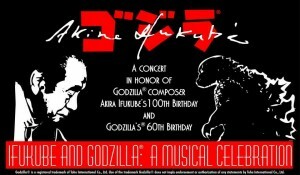 Ifukube and Godzilla: A Musical Celebration is a kickstarter campaign with a goal to fund a live symphonic concert celebrating the connection between composer Akira Ifukube and Godzilla. Check it out, folks – it’s our first bonus episode (#105) of 2014 and I had the pleasure of speaking with John DeSentis and Chris Oglio about their current crowdsourced project, Ifukube & Godzilla: A Musical Celebration. This is one of the coolest ideas that I’ve seen on Kickstarter and I absolutely want to see it come to fruition. They need the support of Godzilla fans around the world and although the donations are coming in and the project is going strong, they have a long road to go in the next 20 days! Have you ever seen Godzilla Fantasia? The music from that impressive montage was performed live in Japan and it must have been a sight and sound to behold. Imagine being able to see a 50-piece symphony perform a full concert of Akira Ifukube’s iconic work from the Godzilla series. As a fan of the music in these films, I’m really hoping to see this in Chicago this summer during G-Fest and I hope you do too. After listening to the episode, please consider heading over to the Kickstarter’s page and choosing a donation level to back this amazing project! Because this was a bonus episode, we didn’t cover any news items, but we closed the episode with a total of seven Ifukube tracks from some of our favorite scores. Don’t forget to tune into tomorrow’s installment of MONSTER MUSIC MONDAYS to hear a very special playlist put together by John DeSentis celebrating 100 years of Ifukube and his music. It’s sure to be a great selection of classic Ifukube and I’ll be playing the set several times during the stream!